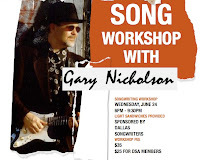 PLEASE PRE-REGISTER by emailing to info at dallassongwriters.org "RSVP Workshop" in the subject line. or by cash or check at the workshop. He has recent cuts with Ringo Starr, George Strait, Keb Mo, John Mayall, Buddy Guy, and song in upcoming Jeff Bridges movie.